On-Demand Hot Water Systems: Are We Ready? Your thermostat, when working properly, runs on a transformer to set and adjust the amount of heat your furnace delivers to your home. Imagine how you might feel one cold winter morning when you adjust your thermostat and nothing happens! Brrr! There are simple ways to troubleshoot your problem, but ultimately you may have more on your hands than you can handle. Let's look at some simple causes. Your thermostat unit may have a short, a circuit may have blown or tripped a breaker, or a dusty thermostat unit may be blocked from reading the proper settings. At the heart of the thermostat is the bimetallic coil, a wound strip of metal that expands or contracts under the influence of temperatures. Wouldn't you be lucky if all you needed to do to get the thermostat working again was to dust off the coil? You need to eliminate some of the suspects, one-by-one, flipping back the breakers, replacing fuses, or checking your electrical connections. If you open your thermostat, you'll most likely find a disc connected by a thin wire to the bimetallic coil. When the heat anticipator is adjusted properly, it heats the coil to room temperature so that your furnace won't keep bursting on and off with minute changes in heat or cold. 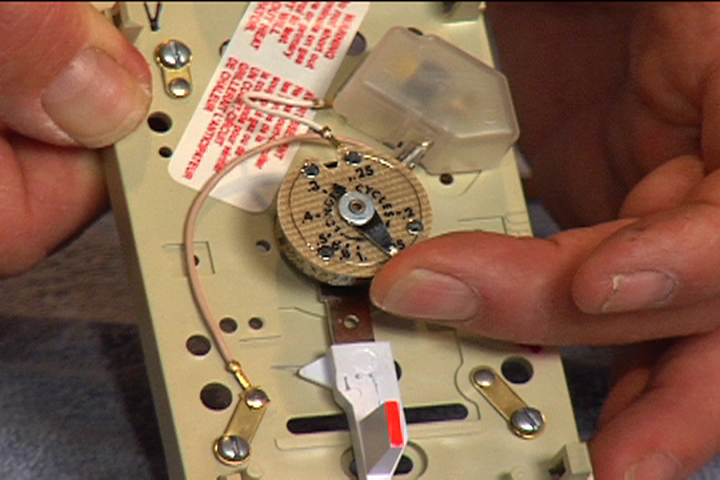 If it operates too often, it can harm your thermostat or heating unit. Make sure that the thermostat box has been mounted on the level. A crooked unit can affect the workings of the coil and heat anticipator. In most units, the anticipator is connected over a scale printed on the circular disc. By moving the tab to and fro over the temperature settings, you just might free a stuck heat anticipator. The disc on the anticipator usually has the word "longer" etched or printed on it. For a unit that turns on and off too frequently or fails to reach the temperature set on the thermostat, you should adjust the anticipator arm toward the word "longer" and give it a few hours to see if it solves your dilemma. By using the correct anticipator setting, you conserve energy, by using pre-heated air already in the furnace system to fill your home before additional heat is generated. If that doesn't work, you may have to call in an HVAC contractor to snoop out the cause. This entry was posted on Tuesday, October 27th, 2009 at 01:10 pm and is filed under Electrical , Bathrooms , Remodeling , Home Maintenance , General Remodeling . You can follow any responses to this entry through the RSS 2.0 feed. Can cats and and people with alergies live in the same house?